Manufacturer of a wide range of products which include cable drum jack plinth. As a noteworthy entity of this domain, we provide clients with the premium quality of Cable Drum Jack plinth Fabricated by using steel and cutting-edge machinery, the size of the is 1200mm x 320mm x 300mm. 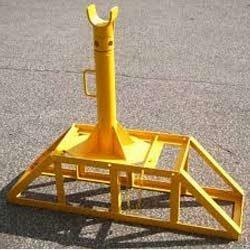 In addition to this, the Cable Drum jack plinth is known for providing additional 300mm lift safety.